Anger is one of the most misunderstood emotions. It tends to be regarded as negative, because it is mostly associated with its extreme forms: rage, bullying, violence and destruction. 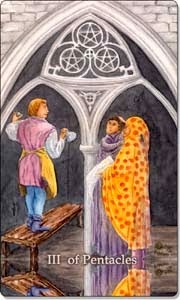 In Astrology, anger is associated with Mars, and in the Tarot, Mars is linked to the Tower. 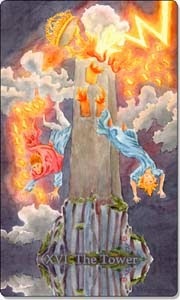 The forces we see in this card are destructive, an outburst of energy. We are all taught from an early age that anger is bad, and we need to suppress it. True, we don't want this powerful energy to get out of hand, but learning instead how make use of it more constructively can be liberating and life-transforming in a positive way. Anger is actually good for you, when it takes you from a position of powerlessness to empowerment. When you say "enough is enough". When you are stuck in sadness or depression, feeling angry about what caused your situation can pull you out of your black hole. When it feels better to be mad than sad, you begin to stand up for yourself, speak up and fight back. When you have to cope with loss or bereavement, you will feel anger at one point during that process. It will help you move forward. It is important to release anger, but not by killing people or destroying their property, but in a more creative and healing way. 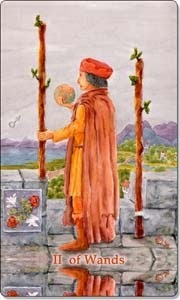 The Martian energies, including anger, are also present in Minor Arcana cards linked to Mars. They can teach us a lot about anger, its causes and consequences as well as how we can turn it into a positive force. We don't see any anger in this card, but it may encourage you to use your anger as fuel towards a new beginning. Looking to the future, making plans, nurturing your aspirations and setting new goals. Perhaps you have just lost your job, you are angry about how you have been treated. Use your anger to find a better job, work for the competition and become more successful. See what anger does to you when you don't let it out? The urge to release anger is often suppressed by fear. Fear of punishment, of hurting others, of feeling guilty. Fear causes suffering. There is a sense of feeling powerless in this image. 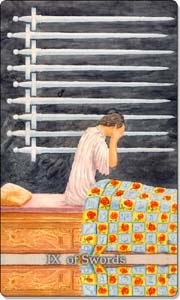 The Nine of Swords is asking us to shift those limiting beliefs of reluctance and inhibitions through communication. When your situation is desperate, and there is no improvement in sight ("I can't do this"), anger can help to overcome fear (shift towards empowerment) and can cause quite a revolution. 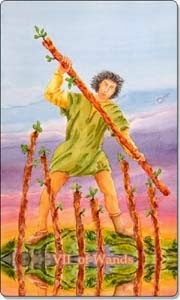 The longer anger is suppressed, the worse the consequences will be when released. We see a lot of physical energy in this card - there is a sense of high adrenaline, stress, frantically defending or working on something. We can also see determination and persistence (perhaps even obsession), but how long can this man keep going? Anger can be released by taking action, through physical exercise and practising self-care. Running, gym sessions, dancing....any exercise you feel passionate about. Releasing anger through physical activity can lead to emotional and mental recovery. Sadness, disappointment, loss. You cannot get passed those debilitating emotions without a spark of anger. Without crying, ranting, screaming or writing soppy poetry to express your anger about someone, who hurt you, you cannot move forward and cross that bridge in the distance towards a happier life. Rather than directing your anger towards others (including the guilty party), express your uncensored thoughts and feelings in a journal or artwork, such as sculpting or painting. No hint of anger in this image, but the Martian energies may encourage teamwork and collaboration. Don't be angry on your own. Get together with like-minded souls, who are equally unhappy about a situation. In a group, you can work on making changes for the better. Think of trade unions, animal rights and environmental organisations, where you can channel your anger about unacceptable conditions into a transformative force. Such a happy image, and yet the Martian energies are simmering beneath the surface, ensuring that happiness won't last forever. 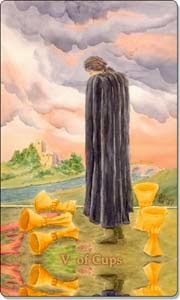 The message of the Ten of Cups regarding anger is to develop a healthy relationship to feeling and releasing it. Only suppressed anger leads to long-term resentment and bitterness. In a relationship, it is important to express your anger without fear or guilt, rather than pretending everything is fine. Releasing anger in a constructive way can actually improve a relationship, and yes, it could break it, too, but then perhaps that would also be for the best. Forming a healthy relationship with anger, embracing it rather than demonising it, is a powerful life skill helping you to grow, heal and transform in a positive way. 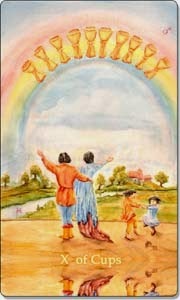 How is the Tarot helping you to release, express and heal your anger? You can also connect with me on Facebook, Twitter, Pinterest and Instagram. "Anger is actually good for you, when it takes you from a position of powerlessness to empowerment" Well spoken!!! I've been raised with the notion too that anger is bad . Nowadays I journal a lot and sometimes I release my anger in art. It is still hard for me to express it in public. Thank you, Ellen. 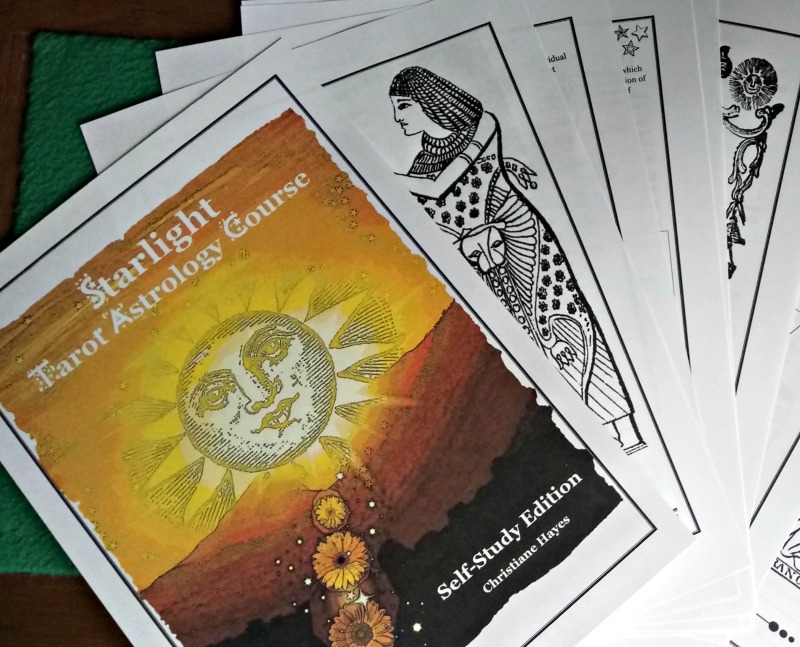 It's always thrilling to discover, how Tarot is used as a therapeutic tool for self-development and growth. 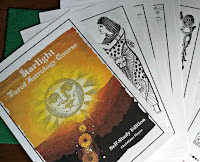 Laying out a mandala with tarot cards can indeed be very effective as a meditative tool towards healing.